At the Cosmo Howley mine, Pine Creek area, NT, Australia, the Au occurs within extensive stratiform quartz units. These were claimed to be stratiform cherts within the sequence. However, decrepitation shows that all these quartz samples contain abundant high temperature fluid inclusions, with high CO2 contents and high internal pressures. These types of fluid inclusions are inconsistent with a chert host material and it is clear that the auriferous horizon is in fact an epigenetic quartz related to the intrusion of the nearby granites. The decrepitation results show that this deposit is in fact a stratabound replacement type deposit, and not a "syn-sedimentary exhalative gold in sedimentary cherts" type, as has been stated elsewhere. 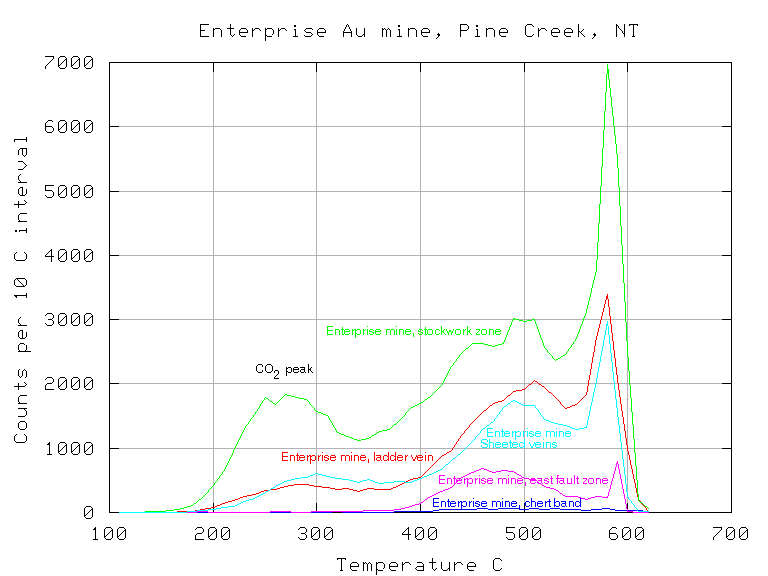 An initial microthermometric fluid inclusion study of samples from the Enterprise mine, came to the conclusion that the deposit formed from fluids which lacked and CO2 content. A subsequent decrepitation study showed that over 50% of the samples collected had a prominent low temperature decrepitation peak, indicating that CO2-rich fluids were in fact a major component of the mineralising fluids. Samples from the eastern limb of the fold tended to lack CO2, but samples from the ore bearing sheeted and stockwork vein areas always contained CO2-rich fluid inclusions. 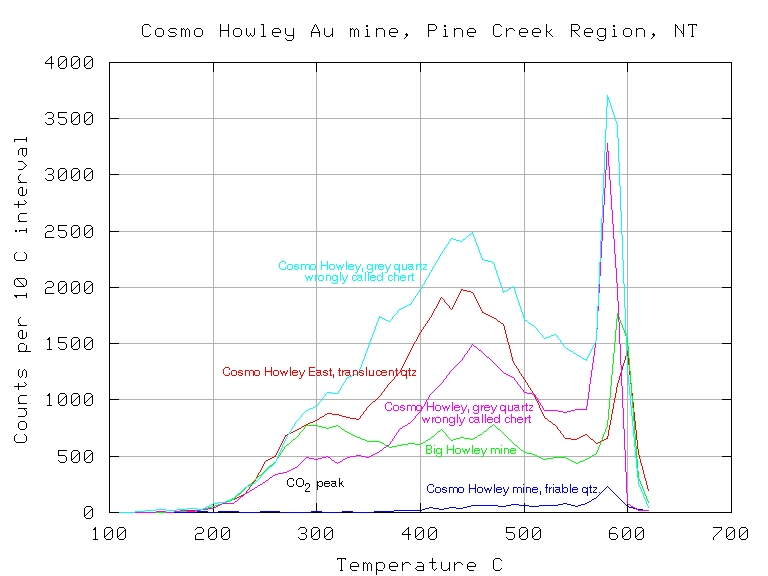 The Au mineralisation is closely related to the CO2-rich fluids. The initial study was compromised by the inability to collect an extensive suite of relevant samples and the choice of the operator to use transparent quartz, rather than the more common milky quartz. In this case decrepitation analyses were a much more reliable indicator of the mineralisation fluids than were the microthermometric data.